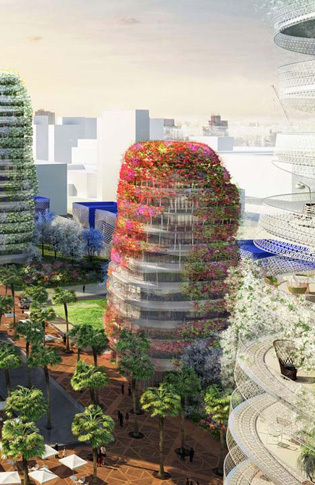 Walls of foliage will surround towers and create a series of brightly coloured vertical gardens in what will be the first development of its kind in Africa. 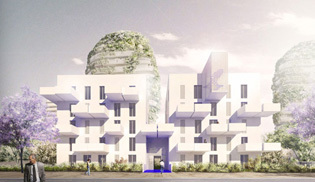 Flowering vines will sprawl across the facades of four tower blocks underway in Casablanca by French studio Maison Edouard François, creating a series of brightly coloured vertical gardens. Located in the Les Hopitaux district of the North African city, the Gardens of Anfa project by Maison Edouard François comprises three mid-rise residential towers and a low-rise office block. 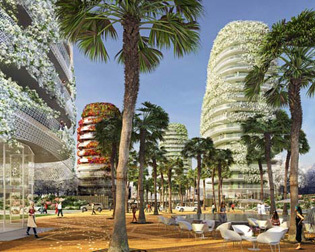 Set to complete by 2017, it will be the first development in Africa to feature vertical gardens this extensively. Each floor of the three 16-storey residential towers will feature wrap-around balconies with screens made from an interwoven mesh. The balcony walls will be planted with jasmine or white bougainvillea, an ornamental vine native to South America. As the plants become established they will grow throughout the mesh, creating a blanket effect on the exteriors of the buildings. The 12-storey office block meanwhile will be differentiated from the surrounding buildings by the multicoloured flowers adorning its facade. The development encompasses a 50,000 square metre site. Once complete, it will become a new mixed-use quarter that will also include public spaces, underground car parking and a series of low-rise residential blocks. At the base of the towers, public spaces will include seating, cafes, water features and a thoroughfare for cars and buses. Washingtonia palm trees will create a dense thicket of foliage, shading pedestrians from the intense Moroccan sun. 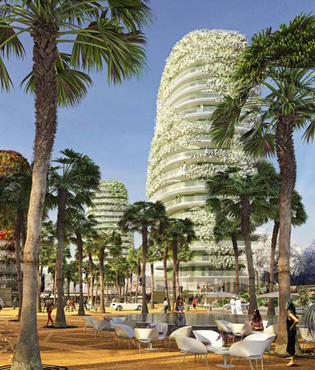 Moving further away from the centre, trees and bushes of blue and white blossoms will be planted to separate the towers from the low-rise residential buildings that form the outer edge of the development. These buildings will feature a series of balconies jutting out from the facade at random, and are also intended to incorporate vertical gardens. A row of purple blossom trees will form an outer perimeter, completing the development. "These residential buildings break down the scale of the high-rise towers to give the park an inhabited character. This architecture of individual buildings demarcates the limits of the gardens," said a spokesperson. 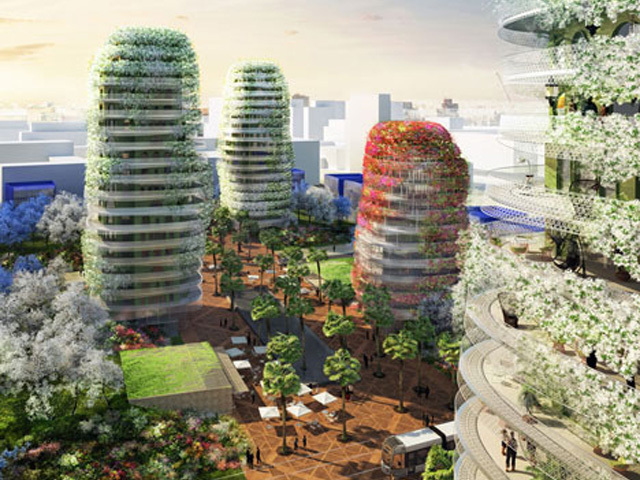 This isn’t the first time Maison Edouard François has combined high-rise buildings with plants. Tour Végétale de Nantes was a concept unveiled by the studio in 2011 that featured trees and shrubs growing in stainless steel tubes on each floor of a tower.